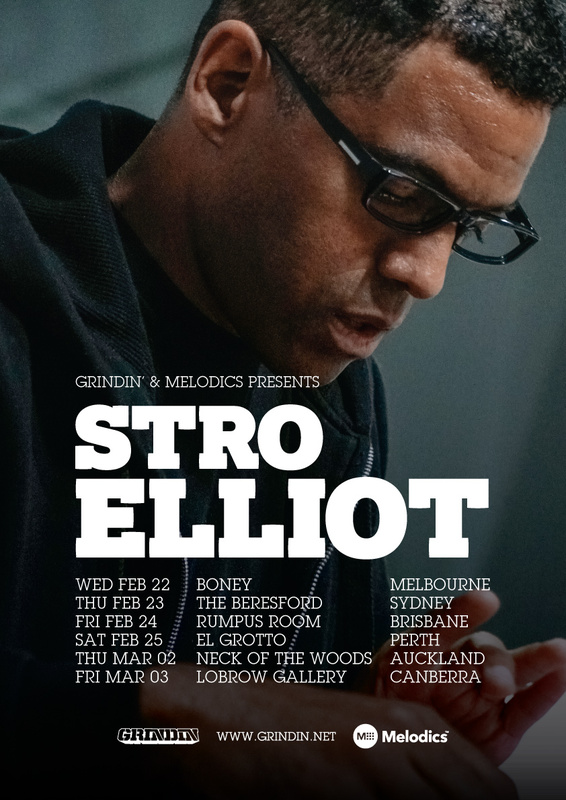 Stro Elliot doesn’t just make beats – he makes music. As a child of military parents, he travelled the world marinating in a record collection that spanned from jazz greats like Miles Davis and Herbie Hancock, to funk/soul luminaries like Stevie Wonder, Funkadelic, and Prince. Studying trumpet, piano, and then drums and guitar, Stro became a skilled multi-instrumentalist, even as he began to explore the world of hip hop, drawn to the likes of A Tribe Called Quest, De La Soul, The Pharcyde, and Ice Cube. Stro began his production career while studying music at the University of Northern Colorado. As a founding member of critically-acclaimed hip hop group The Procussions, Stro produced their debut single, “All That It Takes,” which hit the top ten on CMJ’s national hip hop chart. Riding this wave of attention, Stro moved with the group to LA, gaining praise for his uniquely varied beatwork on their independent debut, As Iron Sharpens Iron, and his live drum and Rhodes piano work on their improvised EP, Up All Night. When The Procussions were chosen to spearhead the relaunch of classic hip hop imprint, Rawkus Records, Stro received critical acclaim for his production work on their major label debut, 5 Sparrows For 2 Cents. Invited to tour with childhood heroes like A Tribe Called Quest, De La Soul, and The Roots, Stro found his unique fusion of hip hop, soul, and jazz gaining praise from tastemakers and fellow producers like J Rocc (Beat Junkies), DJ Jazzy Jeff, and Maseo (De La Soul). Even while touring the globe and keeping The Procussions supplied with beats, Stro found time to work with a wide range of respected independent hip hop artists including Deux Process, Ohmega Watts, and (Sharlok) Poems (of LA Symphony). When, in 2007, The Procussions took an indefinite hiatus, Stro kept rolling, providing production for artists such as Wrekonize (of ¡Mayday! ), One Block Radius, Elzhi, and Phonte. He has also brought his talents and experience as a writer, arranger, and vocalist to multiple collaborations with his former Procussions bandmate, Mr J. Medeiros. Not content to rest on his laurels, Stro recently expanded into the world of film providing soundtracks for filmmaker Hilton Carter’s dramatic short, Victor, and animation series, Lessons. He continues to receive praise from for his unique blends of live instrumentation, samples, and programming most recently showcased on The Procussions’ latest self-titled album, released September 24, 2013. Its heady brew of hip hop, rock, pop, jazz and soul turned heads, earning praise from the likes of Okayplayer , and DJ Booth, proving Stro is a producer whose best work is still to come. Stro’s invitation to Jazzy Jeff’s Inaugural all-star Playlist Retreat echoes that statement.